The adorable EMU Australia kids and bubs ugg boots at Uggs & Kisses are simply irresistible. Made from the softest Australian sheepskin, they are a childish twist on the conventional ugg boot. 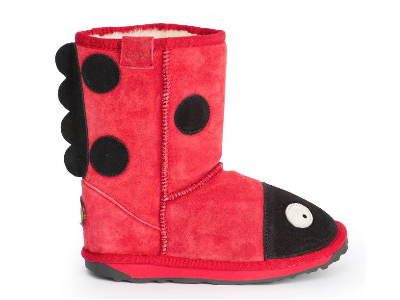 Featured is the Little Creatures Ladybird. They are also a great travel companion for those holidaying in winter climates! This is a great gift for bubs and kids from ages 0 through to 12. There is a huge range of adult uggs at Uggs & Kisses too!